There are two things that Mothers’ love in this world almost as much as she loves her child, roses & sweets! 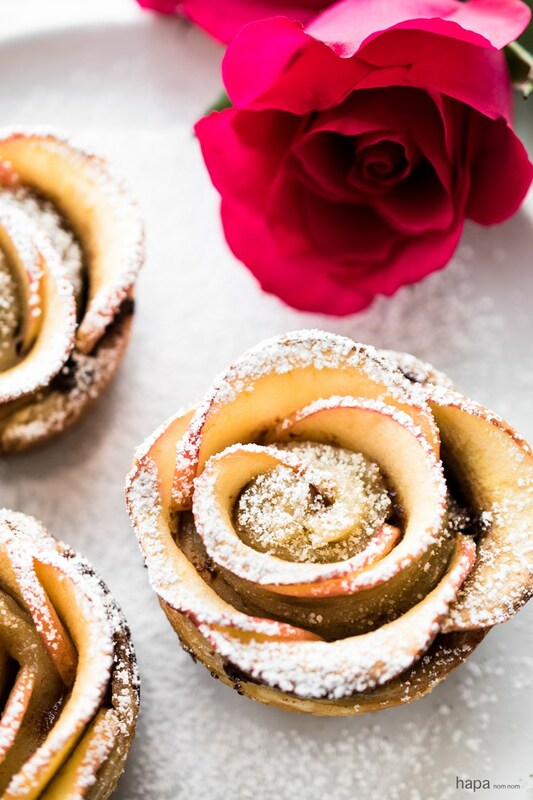 🙂 Why not spoil her with a combination of both with these adorable, easy, and yummy puff pastry Nutella apple roses. Remove the puff pastry from the freezer and allow to thaw for 30-40 minutes, until pastry unfolds easily. Do not let it sit out longer than 40 minutes. Meanwhile, grease 6 cups of a muffin tin with the butter and set aside. Core the apples and cut in half. Then thinly slice into half-moon shapes (if they’re too thick, they will snap when folded into the pastry). Place the sliced apples into a large bowl and cover with water. Add the lemon juice and swirl with your fingers. Microwave for 3 minutes to soften the apple slices. Alternatively, you can simmer them on the stove until pliable. Then strain out the water and set aside. Lightly flour your work surface. Unfold the puff pastry sheet, lightly flour the top and roll out lengthwise to about 15 inches in length. Cut into 6 equal slices, approximately 2½ inches wide. Thinly spread each pastry slice with 1 tablespoon of Nutella – don’t take it all the way to the edge of the puff pastry. Place the apple slices at the top half of the strip of puff pastry and so that they’re overlapping by half. Be sure to start layering the apples about a ½-inch in from the side edge of the pastry and stop about ½-inch from the end, so they’ll roll up more easily. (See video for visual instruction). Fold up the bottom part of the dough to cover the bottom half of the sliced apples – it’s kind of like your tucking them into bed. Gently press to seal and then roll from one end to the other and carefully place into the greased muffin tin. Bake for 40 – 45 minutes, until cooked. Check at about the 30 minute mark, if the apples are looking like they’re burning before the puff pastry has cooked through, cover with aluminum foil. Thank you so much to Hapa Nom Nom for this simple and delicious idea to spoil the mothers in our lives. Head on over to hapanomnom.com for more creative and delicious recipes.